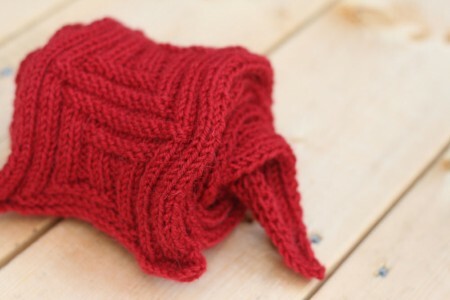 You all know about the Red Scarf Project, right? This is Norma’s charity of choice and it’s a fine one. I could try and write great things about this project and why it’s so important but Norma has already said it much better than I could. The Red Scarf Project, a project of the Orphan Foundation of America, or Orphan.org, collects scarves to send in Valentine’s Day care packages to college students who have aged out of foster care. These brave young people are going it on their own and trying to improve their lives and the community by attending college. The care packages are welcome tokens of encouragement to young people who otherwise receive little to no mail. 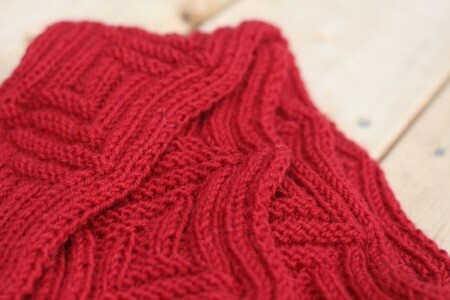 I lifted that right off Norma’s Red Scarf Project blog but I don’t think she’ll mind. And I don’t think she’ll mind that this year, instead of sending money as I have for the past 2 years, I’m sending scarves. Here’s the first one. 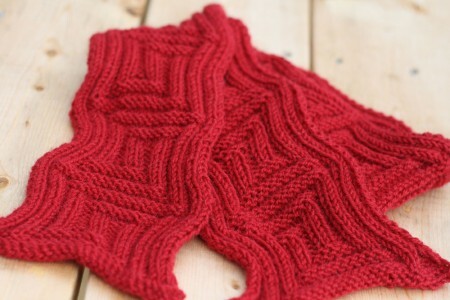 The pattern is Mabel’s Scarf by Larissa Brown and the yarn is Berrocco Ultra Alpaca in a beautiful tomato red. I only used one skein and it could perhaps be a might bit longer but I’m hopeful it will make a college student warm and happy this Valentine’s Day. I love the geographical pattern and think that makes it very unisex – something that’s very important for these scarves. Another thing that’s important about these scarves is that they be of excellent quality. Oh hell, I’ll let Norma say it again. Please remember QUALITY. This is not for beginner knitters or crocheters. RED! is the MUCH PREFERRED COLOR. Other tasteful UNISEX colors are acceptable, but RED is PREFERRED. Absolutely NO PINK or LAVENDER, and no colors that the general public might not like. Yellows, oranges, and certain shades of green are examples of what I’m talking about. Some people (me included) love those colors — others really get turned off by them. NO LACE. NO FRILLS. NO ROTINI SCARVES. NO FUN FUR. So that’s the deal with the Red Scarf Project 2009. Scarves can be sent from 9/1 – 12/15 and I plan on knitting another scarf or two to go along with this one. I’m hoping that some of you will join me and make a hard-working college student warm and happy. Beautiful! I’ve been working on mine too. I hope I can make two as well. Nicely made. Love the effect of the knits and purls. I’ll bet it was fun! That sounds like a great idea! I am going to look up her site and make one as well. Do you have any pattern suggestions? That’s a great looking scarf! Looks great and you reminded me that I need to knit that pattern! Nice scarf. It’s been in my queue for a while. Time to cast on! Thanks for the reminder about the Red Scarf Project. I should go choose yarn for my contribution this year. I love that last picture. Fun. I’m adding this pattern to my to do list. What a beautiful scarf! It will be a lovely gift. Very lovely! I’m starting to see a lot of red popping up all over! Great post and what a wonderful scarf! I really need to get start on my red scarf soon. Very excellent! I have two so far (Sibyl and a new pattern to be revealed later), and I’ll be making at least one more. You did good, girl! This is going to make someone feel special. Love it in a solid! I made one last year out of Malabrigo and gave it to a co-worker. I am going to dig through the stash and start another. I am about to cast off my Red Scarf this week. Yay Carole!! Both for promoting Red Scarf and for knitting such a great one, you know a college student will love it . I have a half finished sideways striped one for Red Scarf that I’m not excited about. I’d never been drawn to the Mabels’ Scarf pattern before but I just LOVE it in red as you’ve knit it, and I love that yarn, so…..onward! I like that scarf. Quality rocks! I just need to find the time to knit a few for the cause. I was going to make a few on the sock machine but wasn’t sure they’d be good enough so…I gave up that idea. Yours looks awesome and I’m sure it will make a college student very happy!